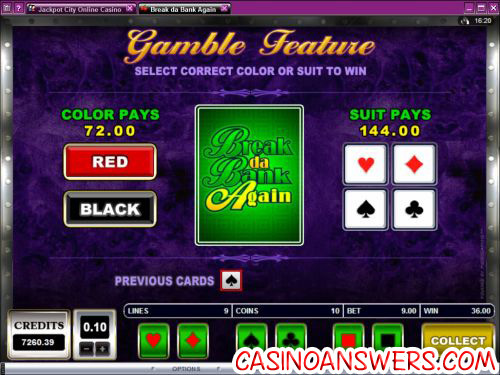 Break Da Bank Again Video Slot Guide & Review - Casino Answers! Break da Bank Again is a 5-reel, 9-line video slot developed by Microgaming, featuring wild symbols, scatter wins, multipliers, a free spins feature and a gamble feature. 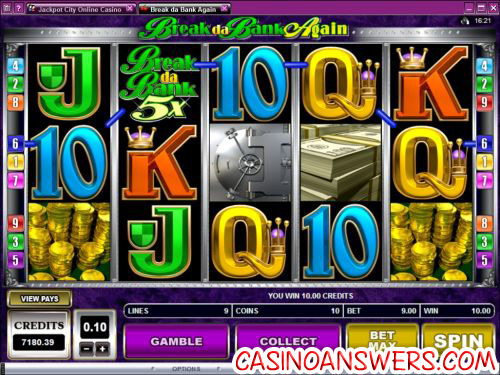 You can play the Break da Bank Again video slot at Lucky Nugget Casino and Ladbrokes Casino. To play Break da Bank Again, you will first want to set your coin value at one of the following amounts: $0.01, $0.02, $0.05, $0.10, $0.20 and $0.25. You may also set the number of coins you wish to bet per line (up to 10) and the number of active paylines (up to 9). The lowest total bet you can make on Break da Bank Again is $0.01 per spin, with the highest total bet being $22.50. Break da Bank Again is excellent for casual slots and low stakes players. This is much different from the video slot’s predecessor, which was more of a high roller slot. To play Break da Bank Again with all 9 paylines active and all 10 coins, use “Bet Max.” To play using your set wager, use the “Spin” button. To win Break da Bank Again’s 1500 coin top fixed jackpot, you must hit five Jewel symbols on an active payline. The Gold Bars symbol is another valuable symbol – five of them are worth 1000 coins. The Break da Bank Again symbol acts as a wild symbol as well as a multiplier. While it doesn’t pay out by itself, any win where the wild symbol completes a winning combination, it will multiply your winnings by 5X. During free spins, it will become a 25X multiplier, which is incredible. The Break da Bank Again wild symbol substitutes for all symbols except for scatters. If you hit 3, 4 or 5 Vault symbols anywhere on the reels in Break da Bank Again, you will win 15, 20 or 25 free spins respectively with a 5X multiplier. In the free spins feature, you can win up to 375,000 coins! All wins during the free spins feature will be multiplied by 5X. Although the free spins feature cannot be re-triggered, each additional Vault symbol will award you an additional free spin. All bets and paylines played during the free spins feature are the same as the triggering spin. Whenever you win on the Break da Bank Again video slot game, you have the option of hitting the “Gamble” button to risk your winnings in the gamble feature. You can either double your winnings by guessing the colour of the card correctly or quadruple them by guessing the suit correctly. You may gamble your winnings until the gamble limit is reached. Hit the “Collect” button to exit the gamble feature. Only the highest win is paid per selected payline. All wins pay left to right except for the scatter symbol which pays any. All wins are multiplied by coins staked per line except for scatter wins. Switching Break da Bank Again over to Expert mode gives you the ability to access its autoplay feature. You will be able to set advanced settings including the number of autoplay spins (from 5 to 500) and to stop if a win exceeds or equals (from $100 to $9999). Autoplay will stop if any feature in the slot game is triggered. You may stop autoplay at any time. With all of the possibilities for huge multipliers and free spins, it’s no wonder Break da Bank Again is one of the most popular video slots at Lucky Nugget Casino. When you sign up there, you will be given $1000 free to play with for one hour and you will be able to keep your winnings. Try Break da Bank Again out for free now at Lucky Nugget Casino! Can USA players play Break da Bank Again for real money? Unfortunately, USA players cannot player for real money at Microgaming online casinos. For a great alternative, try out one of our favourite casinos – Bovada Casino! Is there a Break da Bank Again Flash game for Mac users? Macintosh players and other players who prefer the no-download instant play casino can play Break da Bank Again at Lucky Nugget Flash Casino. If you cannot get the Flash slot game to work properly, try installing the latest version of Adobe Flash Player. Is there two break the bank slot machines?